This is a super simple meal that is perfect for those nights that you don’t have time but you want to ensure that you have a nutritious home cooked meal on the table in under 30mins. Steam the vegetables and set aside. 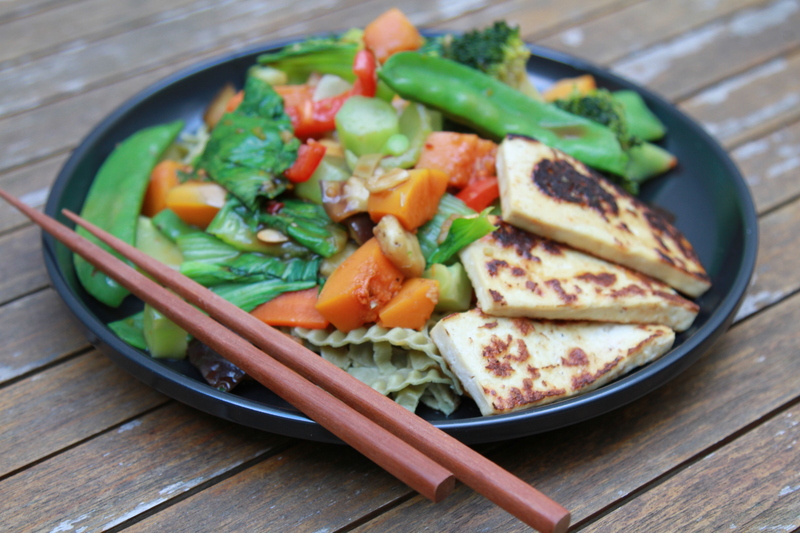 Cook tofu in a pan with a splash of soy sauce and set aside. In a bowl add 250ml vegetable stock, sweet soy sauce, ginger, garlic and chilli and stir to combine. In a separate bowl add cornflour and mix with the 4Tbsp cold water until well combined. Add the cornflour mix to the vegetable stock slowly while whisking to combine. Place vegetables and tofu into a hot wok and add the vegetable stock. Stir constantly till sauce begins to thicken. Options: zucchini noodles, mung bean noodles (my favourite) or soba noodles. Cook the tofu in a pan with a splash of soy sauce and set aside. Serve with your choice of noodles. Options: zucchini noodles, mung bean noodles (my favourite) or soba noodles.